Today we are pleased to welcome Colette Saucier author of this month’s feature Pulse and Prejudice to talk about how she came to quicken our pulses with the presence of vampires. Be sure to enter for a chance to win an autographed copy for yourself! 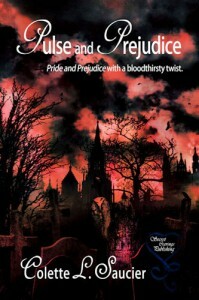 In this, the bicentennial anniversary of what is arguably the most beloved novel of all time, I am asked with increasing frequency, what on Earth possessed me to write a vampire adaptation of Pride and Prejudice? Often this is asked of avowed Jane Austen devotees with a tone of incredulity, if not outright scorn. I would like to take this opportunity to put that question to rest: Lord Byron made me do it. Although I do love his poems, especially “She Walks in Beauty Like the Night” (which is highlighted in Pulse and Prejudice), I found Byron the man more fascinating than Byron the poet. Of particular interest to me was that summer night in Switzerland when Byron gathered together with fellow poet Percy Shelley and their lovers and friends at the Villa Diodati. One stormy night, they decided to tell each other ghost stories, out of which emerged Mary Shelley’s Frankenstein and John Polidori’s The Vampyre. In general, I am not a fan of werewolves, zombies, or other monsters; but I have always liked vampires. I don’t mean the grotesque Nosferatu type or anything that sparkles, but rather the seductive and sensual vampire – the mysterious, charismatic vampire created by Polidori that night in 1816. His Lord Ruthven, modeled on Lord Byron, was the original gentleman vampire. Mr. Darcy is absent through most of Pride and Prejudice, but the few details Miss Austen provided allowed me to remain true to the original Darcy while expanding on his core characteristics to reveal him as a vampire. This also adds another level of complexity to the attraction he feels for Elizabeth Bennet, which he struggles to suppress and to deny. As in Austen’s classic, Darcy’s arrogance and vanity play a role in keeping our lovers apart; but now Darcy faces further challenges in fighting his deepest desires. Frequently in Austen’s narrative, the reader hears of Elizabeth’s liveliness and how it captures Darcy’s attention. For vampire Darcy, it also triggers a hunger for her very lifeblood as well as a craving for life itself that for him no longer exists. Pulse and Prejudice remains faithful to the original plot and style of the classic romance; but where Miss Austen told us Elizabeth’s story, my novel unravels primarily from Darcy’s point of view and follows him to London after he leaves Elizabeth in Hertfordshire. As their paths continue to cross, and vampire Darcy encounters Austen’s Elizabeth, I have woven in just enough of the original narrative so that it can stand alone and appeal to readers who either read Pride and Prejudice ages ago or – gasp! – might have not read it at all! Elizabeth’s discovery of Mr. Darcy’s dark secret necessitates a deviation in plot from canon and a few original scenes through her eyes. Nevertheless, Elizabeth must remain true to the heroine created by Miss Austen. This required a thorough character analysis of Elizabeth Bennet to envision how she would react to these extraordinary circumstances. In studying Elizabeth, I discovered a young woman who is curious and adventurous. Of the five Bennet girls, only she would want to tour the Northern country to see its rocks and mountains. She wants to experience new things – all that life has to offer. A hopeless romantic, she becomes excessively secretive in matters of her own heart. These Austen-given qualities provided the material I needed to understand the behavior of Elizabeth when she steps outside of the original narrative and into the realm of the paranormal, particularly in the volume entitled “Beyond Pride and Prejudice.” In this section, I offer the twenty-first century reader a taste of the passion, lust, and desire that simmers just below the surface in the original. As one reviewer stated: “What would Jane Austen have thought? I think she would have loved this book. She might even have written it herself had she lived in a less constrained age.” High praise indeed! I only hope that readers of this age will enjoy it half so much. 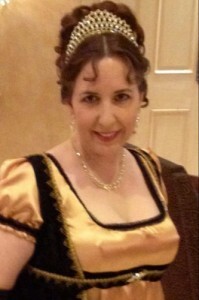 Colette Saucier is the best-selling author of Pulse and Prejudice, the vampire adaptation of the Jane Austen classic, as well as the contemporary novel All My Tomorrows (Readers’ choice, Top 10 Romance Novel of 2012). She has been writing poems, short stories, and novellas since grade school and experienced early success in having several of her poems published in her junior high school newspaper. Her interest in literature led her to marry her college English professor, but eventually a love of history encouraged her to trade up to a British historian. Technical writing has dominated Colette’s career for the past twenty years; but finding little room for creativity in that genre, she has spent the last several years traveling to Europe and Britain, researching Regency England and vampire lore and literature, to complete her first full-length novel. She is currently researching and writing a sequel set in Antebellum New Orleans. Colette lives in South Louisiana with her historian husband and their two dogs.